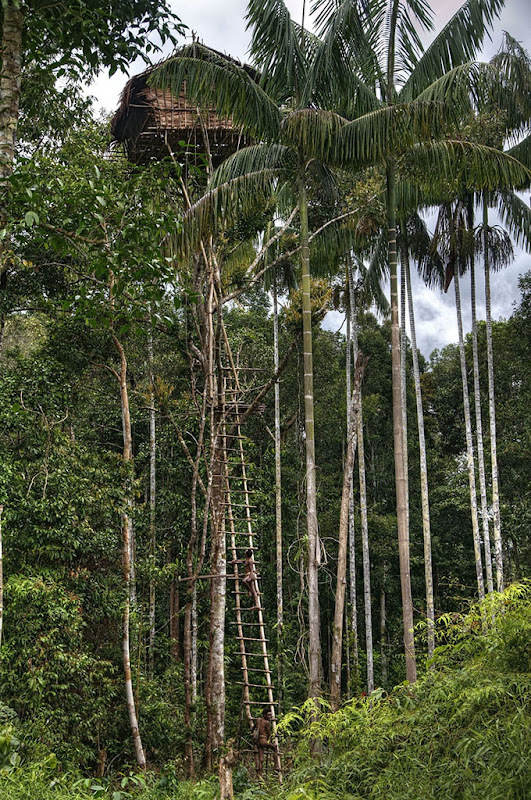 Deep within the inaccessible jungle of the southeast Indonesian province of Papua, about 150 kilometres inland from the Arafura Sea, lives the Korowai tribe – a clan totally isolated from the rest of the world. They are hunter-gatherers living in a small society of traditional family ties who need to share all they have in order to survive. Until their discovery by a Dutch missionary in 1974, the Korowai had hardly any contact with the outside world. 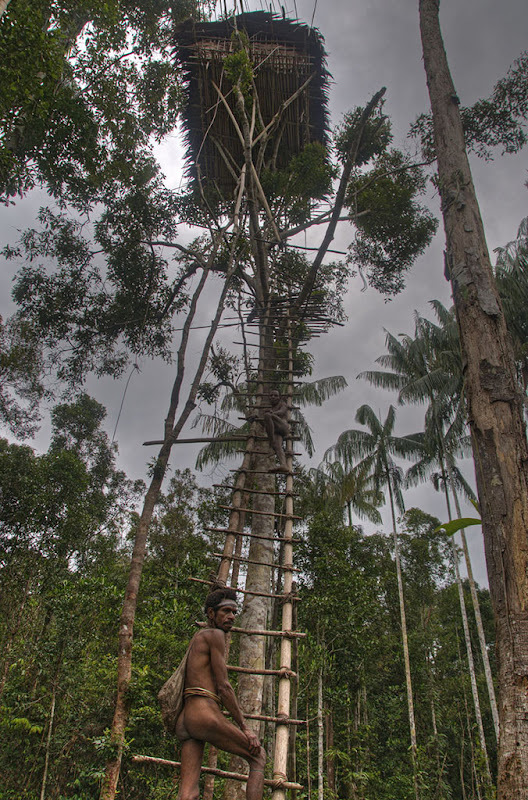 The Korowai people live in tree houses ranging in height from 6 to 12 meters, but some are as high as 35 meters above the ground. 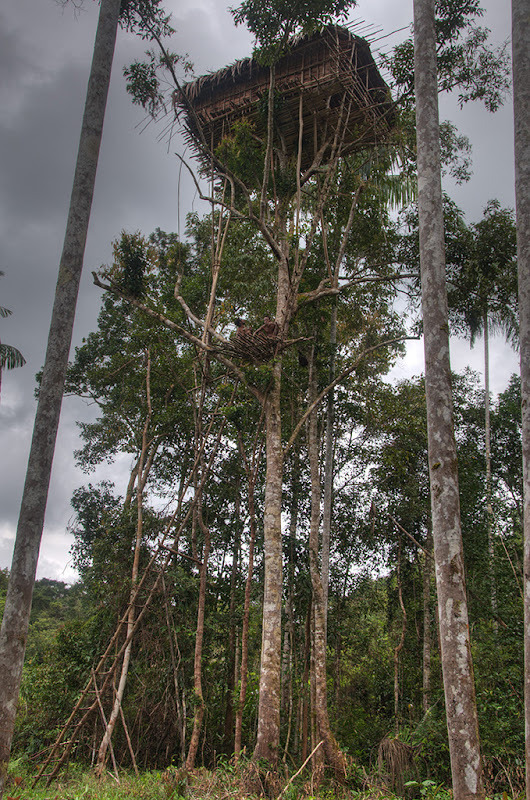 Usually the houses are built on a single tree but frequently the base of the house consists of several living trees, and additional support is derived from wooden poles. 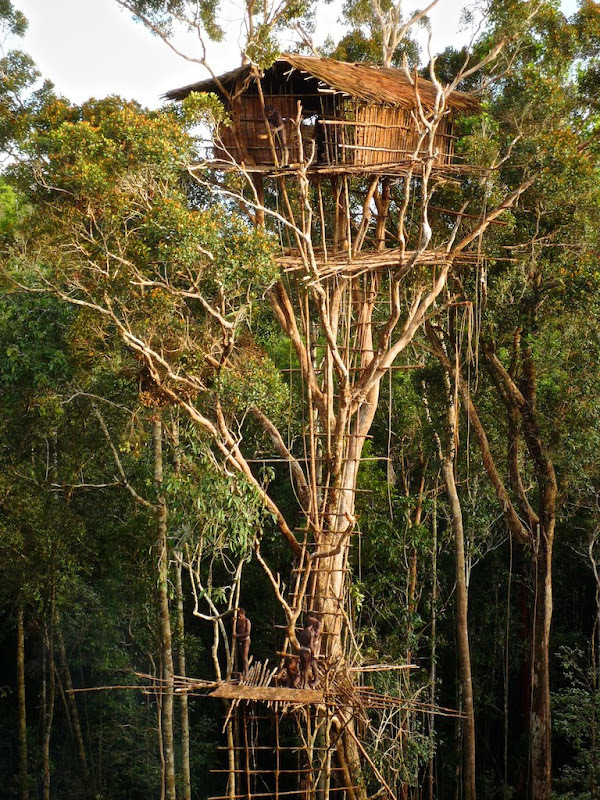 These tree houses protect families not only against swarms of mosquitoes below, but also ward off annoying neighbours and evil spirits. To build a tree house, a sturdy Banyan tree is selected to function as the central pole. The top of the tree is then removed. The floor frame, made of branches, is constructed first and then covered with sago palm. The walls and roof is made with the same leaves the frame of the house consists of branches fastened with rattan bindings. The flooring must be quite strong as the tree houses often accommodate as many as a dozen people. A dry tree trunk with notches is hung from the bottom of the tree house in order to get up to the house. This ladder shakes with each step and warns the inhabitants that a visitor is on his way up. The Korowai are excellent hunter-gatherers and horticulturalists who practice shifting cultivation. Since the early 1990s some of them got involved with tour companies selling tours into the Korowai region and generating moderate cash income this way. To consider, they are same people who, less than two decades ago, never knew a world existed outside their jungle. During the 90s outsiders started exploiting the Korowai region in search of the valuable gaharu (Agarwood). In 1997, 1 kg of gaharu collected by a local Papuan would have a value of about $4.00 when sold to a trader; the gaharu was eventually sold to Middle Eastern and European market for about $1000 a kilo. Gaharu also fuelled a rapid trade in prostitution into the jungles of Papua which has helped contribute to the current AIDS epidemic throughout Papua. Eventually this trade came to an end in 1999. Several documentaries have been made about the Korowai people and countless articles written. In 1993, a film crew documented the Korowai tree house construction and the practice of cannibalism as a form of criminal justice. In 2011, the Korowai tribe was shown in the BBC documentary Human Planet.